Why is a biblical worldview so disturbing? Disturbing to those who adhere to the Bible. Disturbing to those who do not. Could it be because, in a biblical worldview, things that are true match what is real? And reality can be deeply disturbing. We want truth to be the stories we tell about the world and about ourselves. But what if our stories contradict what is real? And what if reality makes headlines? 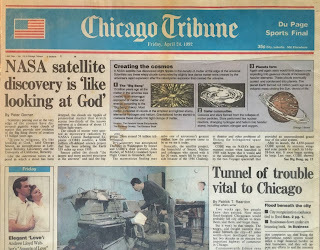 The paper is a little tattered, but you can clearly see the April 24, 1992 Chicago Tribune headline: NASA satellite discovery is ‘like looking at God’. Measurements made by COBE confirmed that the universe had a beginning, which kind of beginning, and that galaxies could form after the beginning. · The story that we don’t need God to explain the universe. · The story that God created the universe six to ten thousand years ago. COBE measurements also helped to determine that the universe is over 13 billion years old. 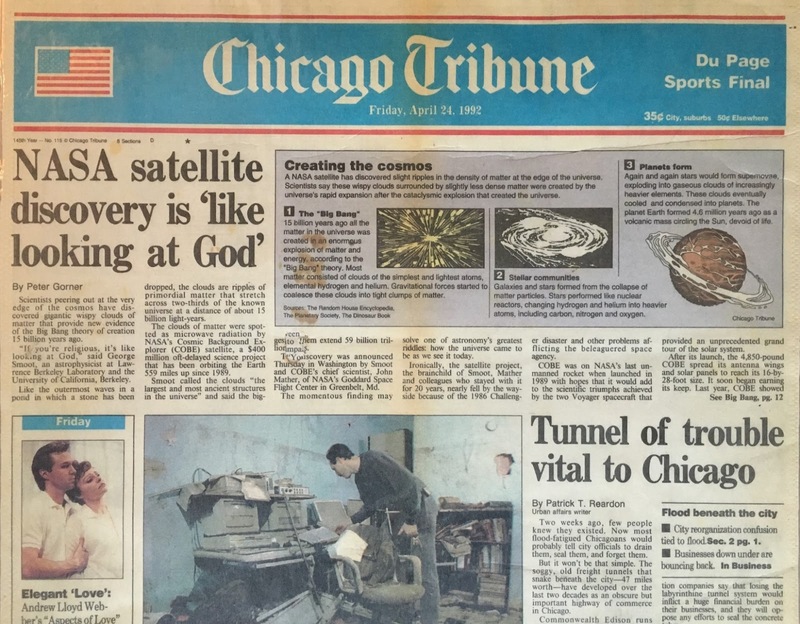 Then the WMAP satellite, launched in 2001, gave even greater precision to the age of the universe, 13.77 ± 0.059 billion years! The satellites measured reality. What do we do when reality contradicts our stories? Connections, from the album “Apologia,” was written in honor of Darwin’s Day 2009. This video is scrolling playback of the song. 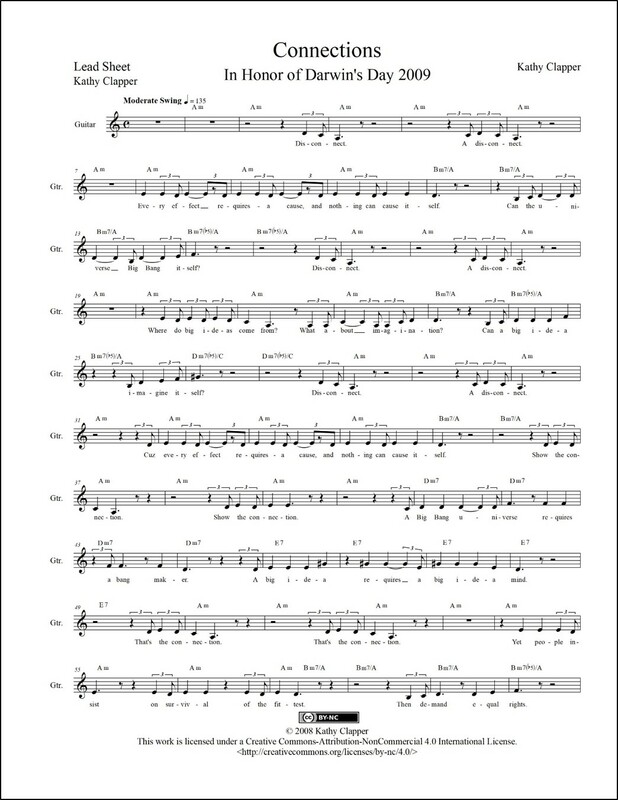 You can get print (PDF) and/or digital (MusicXML™) sheet music for Connections. 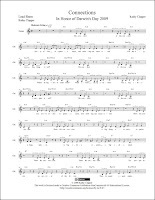 Click here for digital sheet music for jazz band. Click here to learn about COBE. Incidentally, the United Nations Universal Declaration of Human Rights (“Everyone has the right to life, liberty, and security of person.”) has been criticized as a secular understanding of the Judeo-Christian tradition. Click here to read why.